Got Glossaries? Benefit from them. With AnyLexic. 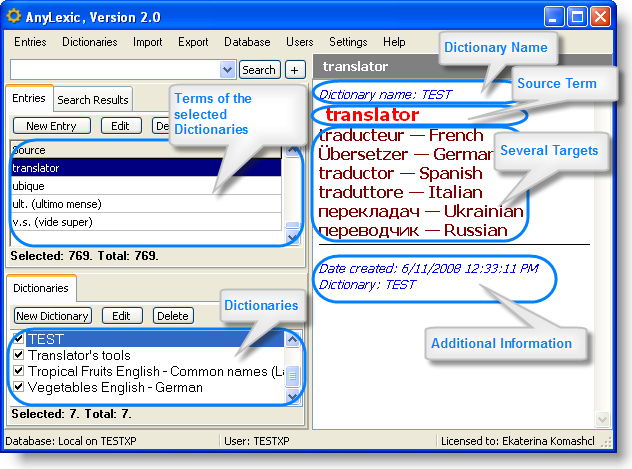 Translators have been using terminology lists for a long period of time. These lists help translators to produce high-quality and consistent translation. If you are a hard working translator I bet you have hundreds of special glossaries or dictionaries which you received from clients! Some of them require so much time to understand, search and use! What if there was a magical software which could take any glossary and make it easy-to-use... you asked about it, and we developed this program. It is based on AIT Terminology Management Engine, which has been time proven and tested by hundreds of translators who have used our previous product in this area — WinLexic: GUI to Microsoft Glossaries ® for Technical Translators and Translation Agencies. AnyLexic: Terminology Management Software is a new generation of the terminology management programs, and is not tied to any particular terminology. It can help you on each stage of translation terminology management process: creation, editing, search, and exchange. Easily create and edit multiple glossaries and dictionaries. Monolingual, bilingual, or multi-language. One term in source language can have multiple equivalents in target language. Search terminology definition in multiple glossaries from ANY program or document using shortcuts. Just select the text and use shortcut! Import glossaries from .TXT, .CSV, and .XLS formats. Use .AEF (AnyLexic Exchange Format) for easy exchange with clients or other translators. Records can be displayed in various templates with configurable text color, background color, font size and text format. You may quickly and easily adjust display of records using templates. Create your own templates for displaying of the records. Quick and easy search of records in database. Advanced search options (“target”, “and”, “whole word”, “exact-match”, etc.). Participate in the further development of the product! We are ALWAYS interested in your feedback at AnyLexic Help Center. Most of our products are developed to save your time, so does AnyLexic. It saves your time and helps you focus on translation. Terminology is one of the most important factors in translation; there is no consistency without terminology. AnyLexic will show you glossaries and dictionaries in convenient way and will simplify process of search for the terms. Standardization is impossible without proper use of terminology. Terminology glossaries usually consist of two columns, one has terms in source language and in the second column there are corresponding terms in target language. It is convenient form until you have hundreds and hundreds of them... what next? You need an efficient tool to search glossaries in a fast and convenient way. You can do this with AnyLexic! Terminology becomes even more important when you co-operate with other translators translating one of the parts of a document. When you work with other translators you need to exchange glossaries and dictionaries and to be sure that reader will understand meaning of the specific term in each chapter of the document. This means that all terms will be named consistently and you will not need to fix them. Each translator may translate the word in his way, that is why terminology so important for your work. AnyLexic provides native convenient format of exchanging dictionaries and glossaries, as well, as import and export capabilities in the most widely used glossary and dictionary storage formats ( .CSV – Comma Separated Values, .TXT – text, .XLS – Microsoft Excel). And all this comes with FULL Unicode support! You may view AnyLexic History to check what improvements have been implemented in the previous builds. Use AnyLexic Tutorials to get acquainted with common operations in AnyLexic and start using it.